2 teams and five individuals per gender from the regions and 4 at large teams. 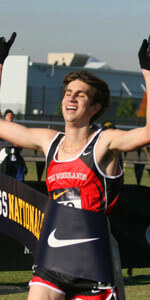 US#1s Rule: Manlius XC, North Spokane XC! 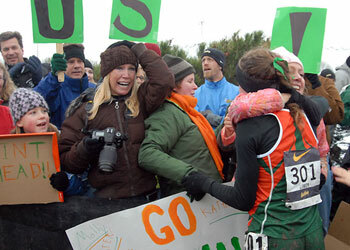 Chelsey Sveinsson TX led a 1-2 finish for the Lonestar State girls, while Manlius XC NY won their 3rd-straight title. Reed Connor TX sealed the Texas individual sweep, and Andy Kimpel led North Spokane WA to the boys team win. The fifth edition of the Nike Cross Nationals dawned with sunshine and the promise (which was realized) of relatively mild temperatures never seen before in this meet. The same bright-eyed excitement, the anticipation of something new and different, was part of the atmosphere surrounding the races, too. By the time the morning was done, the beautiful weather and the meet itself had both delivered, big-time. The first race for individuals, of course, and it was by all accounts a smashing success. The first time two winners have come from the same state, with Texans Reed Connor and Chelsey Sveinsson claiming titles. And it was the first time in the history of the Kenyans coming to the meet that the championship winning times were faster than the open race: The course records by Connor 15:14 and Sveinsson 17:27. There was one huge part of the day, however, that remained the same – even if spectacularly so: The utter dominance of the Manlius XC (Fayetteville-Manlius NY) and the continued reign of New York clubs in the girls championship. It was the third straight crown for Manlius, adding to the titles won by Saratoga in 2004 and Hilton in 2005. The day started with the open races and the exhibition of Kenyan running excellence. While in each race the quintets from the East African nation went out hard and finished hard, this year they dialed it down to cruise control in the middle with the result being relatively modest winning times of 15:51 (Nickson Chepseba) and 18:28 (Elizabeth Mueni). As the day brightened and the temperature moderated, the competition really heated up as the girls championship gun went off. Not surprisingly, though, any question of whether anyone could upset Manlius was quickly answered. By 1K, Manlius had a 55-point lead (raw score) and it was more than double that by 2K. So the attention turned to the battle for 2nd and the individual fight. As if making sure that the Texas presence was known right away, Regan Tindall (Belton XC Club) burst into the lead during the first kilo, along with Danielle Winslow of Adirondack (Queensbury) NY. They would be joined by Sveinsson, Midwest champ Stephanie Morgan (Barnesville XC, Barnesville OH), and Southeast champ Amanda Winslow (Suwanee XC/Collins Hill GA). But after the 2K mark, The Woodlands XC’s Sarah Andrews, the NXN South runner-up to Sveinsson, had recovered from a bad start off the line and charged into the lead. Heading toward the 3K mark, she led Danielle Winslow, Lizzie Predmore, and Sveinsson, with a gap back to a charging Lindsay Flanagan (Lake Park IL) and a fading Morgan. They passed 3K in 10:17 and 2M in 11:05, but then Sveinsson approached her “go” point, from 800-1200 meters out, and just like she did at NXN South, she went. Andrews held for 2nd, nine seconds back, in 17:36. Highlands Ranch CO soph Eleanor Fulton rallied hard for a surprising third in 17:46, followed by Danielle Winslow (17:49) and Flanagan (17:51). Meanwhile, it turned out that Manlius had some adversity to overcome after all: Top-five stalwart Molly Malone came up ill Saturday morning and gritted it out to finish 63rd (33rd team scoring). But she could have finished much further back and they still would have rolled. Courtney Chapman led the way again in 7th (3rd, 17:53), followed by the tight trio of Meghan Anklin in 19th (9th, 18:14), Hannah Luber 21st (10th, 18:15), and Mackenzie Carter 24th (11th, 18:18). The Manlius point total was still ridiculously low at 66, 69 points ahead of Santa Clarita XC (Saugus) CA – which in turn overcame being very “banged up” coming in. Their #1 Kaylin Mahoney didn’t run all week due to bad shin splints, but still took 11th (5th, 18:05) to lead the way for the California champs as they were runner-up (135 pts.) for a second straight year. Taking third with a big breakthrough was US#6 Wilmington XC (Tatnall) DE, which took third (182 pts.) after finishing 20th and 12th the previous two years. They were followed by Empire State powers Kinetic XC (Saratoga) NY with 193, Adirondack XC (Queensbury) NY with 204, and Newton XC (Newton South) MA with 205. By the time the boys took off, the weather was almost fall-like and the energy factor was cranked up to “11.” Following the girls’ lead, the top Texas boys, led by Zach Ornelas, blasted out and the battle was on, with no clear team favorite. A few pretenders were part of the early lead pack, but almost all of those who would finish in the top 5-6 made their way up and the battle was set: South champ and 3rd-placer Reed Connor (The Woodlands XC TX) and Craig Lutz (Flower Mound XC/Marcus TX), Heartland champ and runner-up Jakub Zivec (Grand Rapids XC MN) and Joash Osoro (Bismarck XC ND), Northeast champ Joe Rosa (Plainsboro XC/West Windsor-Plainsboro North NJ), and New York champ Alex Hatz (Manlius XC/Fayetteville-Manlius NY). The pace stayed aggressive, though no one made a major move. They went through 3k together in 8:56. Osoro tested the group on the next set of whoop-de-doos, but wasn’t able to really break. The final move was very sudden. Among the group, Zivec had built the reputation as the fastest finisher, but it was Connor who blasted away at the beginning of the final 250 meters or so, blowing everyone else away to put the finishing touches on a season that concluded with a very impressive string of victories. Straining for the line, the rest of the spent quartet followed as Zivec (15:18), Osoro (15:19), and Rosa (15:19) all followed, almost at once, with Osoro catching his spikes on the finish turf and Rosa having to leap over him. Meanwhile, the team race went back and forth as raw scores indicated North Spokane leading, then Elmhurst, with Naperville close behind. Elmhurst would score 5th and 8th with Jordan Herbert and Steve Sulkin, with North Spokane’s Andrew Kimpel taking 6th to counter. But it was the strength of the Washington club’s 2-3-4 – that’s Leon Dean (23rd), Jeffery Howard (24th), and Benjamin Johnston (27th) that would close the deal for the champions. Unlike the girls race, though, no one knew who was going to win until the scores were announced. North Spokane’s margin was a relatively thin 17 points ahead of Elmhurst, 134-151. Naperville XC followed at 195 and The Woodlands XC at 197. Dean’s comment was fitting. It was truly an amazing day. Experience rules - This matters most, says SteveU in his girls team preview, as the top contenders sort themselves out Saturday. Individual predictions - SteveU picks the top ten in each championship race. Decisive factors - In his boys team preview, Dave Devine looks at the myriad factors that can determine the winner, beyond mere talent. The "Watchout" line - Rob Monroe's previews and top ten picks. Course records could fall with good weather and expanded individual fields led by Jakub Zivec and Stephanie Morgan. Preview by Steve Underwood. About those at large selections - John Dye tells how Nike's good intentions led to unintended consequences. The Teams - All 44 teams with their regional finish, regional rankings and national rankings. Entries include 37 of the 50 teams in Marc Bloom's latest Super 25 national rankings. The Individuals - 90 individual entries. Proof that We're Number One! 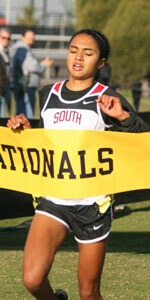 The first four years of NXN (nee NTN - Nike Team Nationals) fulfilled the promise of crowning true national champions. At first, the meet was a coronation and confirmation of long standing power house programs -- Saratoga NY girls and York Elmhurst IL boys -- who frequently topped Marc Bloom's Super 25, the unofficial national rankings prior to NXN. NXN next saw the emergence of new national powers, most notably Fayetteville-Manlius NY girls. Bill Aris' self-regenerating team won in 2006 and 2007 and is shooting for a trifecta in 2008, ranked #1 in the country most of the season until Saugus CA moved ahead after the Mt. SAC Invitational in late October. 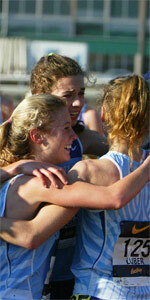 This year comes another change: individuals as well as teams will compete for a national title. The top five boys and top five girls in each region not on a qualifying team were eligible to compete in the national finals in Portland. that their team won girls title for second straight year.